Cougar Gaming was founded in 2008 with the goal of manufacturing peripherals and components for PC enthusiasts who are passionate about gaming. My most recent experience with Cougar Gaming was with the Minos X5, a lightweight, well-built gaming mouse that earned a Legit Reviews Recommended award. 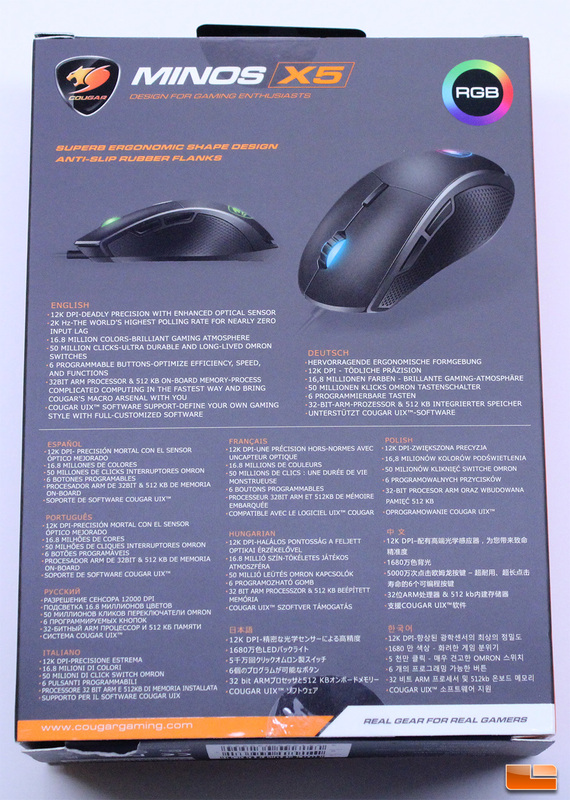 With so many different gaming mice available from countless manufacturers, it can be tough for a brand to gain customer attention, but Cougar was able to compete with some of the best mice on the market with their Minos X5, as it offered excellent performance in a lightweight package with a comfortable shape. When Cougar sent me the Minos X5, they also included another one of their mice, the Revenger S. While the Minos X5 was a compact mouse more suitable for those with smaller hands, the Revenger S is a larger mouse, similar in shape to the Razer DeathAdder. Currently available for $45 at Amazon, the Cougar Revenger S is priced competitively and has all of features users should expect from a gaming mouse in 2018, it’s only a matter of if Cougar has put them all together to equal a comfortable, properly made mouse that can perform well, like they were able to with the Minos X5. The Cougar Revenger S gaming mouse features a Pixart 3360 sensor and Omron 50 Million Click switches, both quality component selections. The PMW3360 sensor is capable of operating up to 12,000 DPI and it has no acceleration or jitter reduction up to 2000 DPI, which is where minimal jitter reduction kicks in. With so many other companies making quality mice for the PC gaming market with Pixart 3360 sensors and Omron switches, it can be hard for Cougar to set themselves apart from the competition. 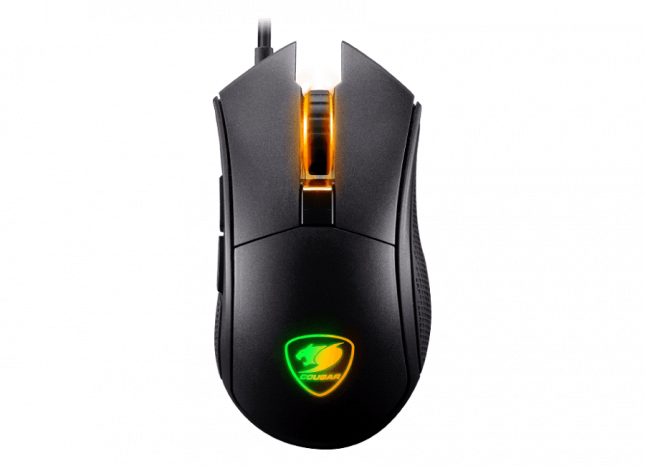 In an effort to help the Revenger S stand apart from other gaming mice with Pixart 3360 sensors and Omron main switches, Cougar has specified it for up to a 2000Hz polling rate, a feature they also included with their Minos X5. 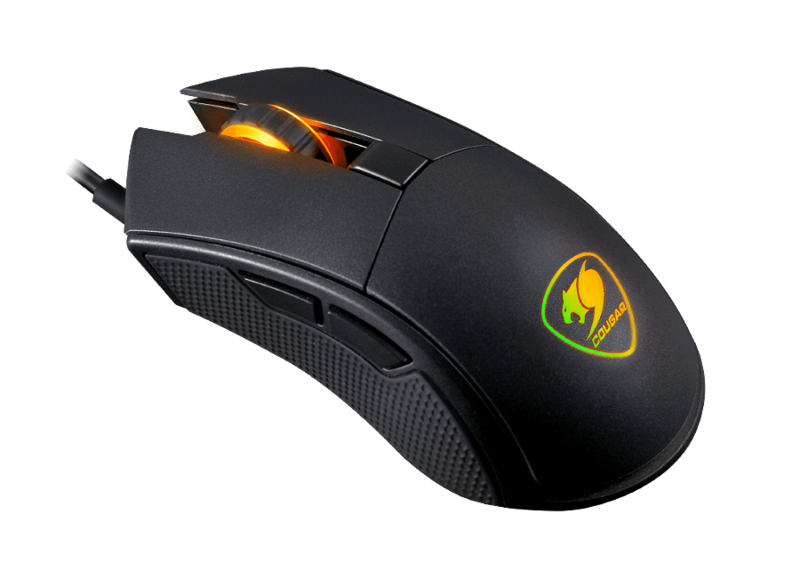 The Cougar Revenger S comes in a nicely designed box with a flip-open front that reveals the mouse within a plastic clamshell cover, which is great for users who want to know the actual size of the mouse before they buy it at the store. 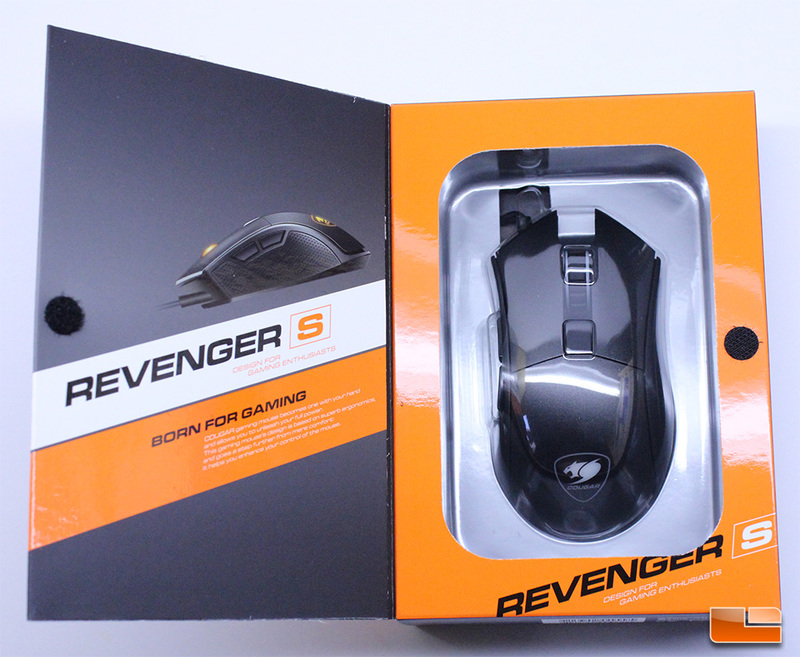 The packaging for the Revenger S is manufactured from quality card stock and plastics to protect the mouse very well during shipping. 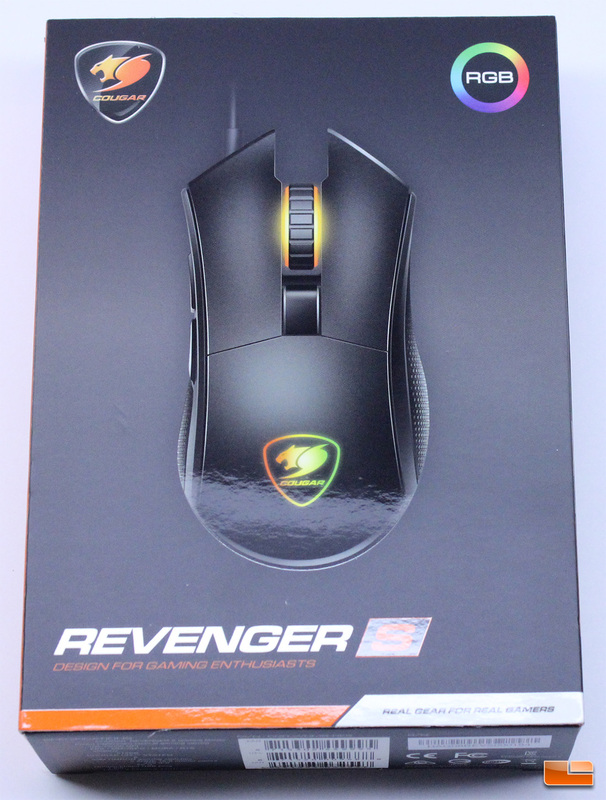 The Revenger S is nicely detailed on the front of the packaging, with an orange-yellow-green effect present on the Cougar logo to help detail the RGB effects the mouse is capable of. The front of the Cougar Revenger S box is void of any information regarding the sensor type or DPI, which may help attract buyers, but this information is available on other sections of the packaging. Cougar includes a manual, warranty guide and a set of Cougar stickers with the Revenger S, along with an extra set of mouse feet. The manual is informative enough, but most users will likely toss it aside. I really appreciate when companies include extra feet with a mouse, as sourcing feet for a mouse you’ve had for a while can be a pain, especially when the mouse isn’t a popular model with aftermarket mouse feet support from a company like Hyperglide. Overall, Cougar does a solid job of including little extras to round out the value of the Revenger S.
Cougar warrants the Revenger S for just a year according to their support site, which I consider to be the bare acceptable minimum for a computer peripheral warranty. With companies like Corsair and Logitech offering two year warranties on their mice, it would be nice for other manufacturers to follow suit. 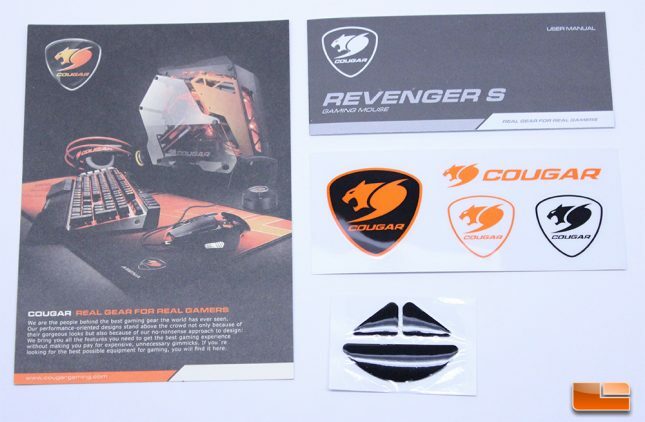 Let’s take a closer look at the Cougar Revenger S, on the next page.